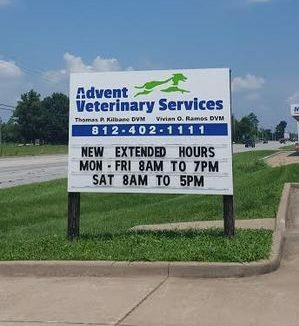 Advent Veterinary Services has experience with many types of creatures: dogs, cats, birds, reptiles, amphibians, rodents, rabbits, marsupials, exotics, wildlife, and zoo animals. Dr. Thomas Kilbane & Dr. Vivian Ramos both have years of experience in the care and treatment of many health issues. With our state of the art facility and equipment and our professional staff, we are equipped to handle many medical situations. Please contact us today if you'd like to make an appointment! We are excited to announce our new hours! We are now open 7 days a week. Our hours are Monday through Friday 7:30am to 7pm, Saturday 7:30am to 5pm, & Sundays from 10am-4pm. Please call us today to set up an appointment!